"Charlie Maynard's pool hall was in the center of town east of Larson's store. Don Maynard took over the pool hall from his father when Prohibition came on," Carmen Moore said. "Of course they had to get rid of liquor in saloons and turn it into just pool halls. "They played cards there and most of the lumberjacks from up Rock Creek used to come down there and play in the evenings and also on Saturdays and Sundays. "The poolhall had what they called "hickies". These were small pasteboard chips that were issued, worth a nickel a piece, issued to players when they won any games. They usually played rummy and pangingi. There was not really any gambling that I saw, like poker and that kind of stuff. "Us kids used to be around there real handy because some of the fellows would win a handful of those chips and they didn't want to have their pockets full of them so they'd hand it out to some of us kids. We could get an ice cream cone or bar of candy for one."*1. Don Maynard had moonshine. In later years he was a highway patrolman in Idaho."*2. Everett Jenkins bought Maynard out in 1920. He sold Ne'er Beer and added another room onto the pool hall. Ordinarily they played cards there. There was a walk-in cooler. He opened up a fresh meat market equipped with lockers and added a few groceries.*3. John Hagerty operated the meat market. Agnes Jenkins, Everett's niece, moved to Noxon in 1924 and worked for Hagerty for a while.*3. "There wasn't enough business to pay the overhead so the place closed. It was a room where they could hang meat in. Everett used to keep his pop and Ne'er Beer. Couldn't get beer," Bob Saint described Maynard's pool hall. "Us kids used to go and open the door from the outside. You could go in and you could help yourself. You'd be surprised. If you ever got caught, you knew somebody was going to get hell beat out of them. But ... we were real quiet when we went in there. That would have been where Hagerty's meat market had been."*5. It fell down during a heavy snowstorm. Stewart Hampton was going home from a dance with somebody and this big "whoomph" came and the whole building just fell right in front them. The whole roof went in. That was the end of Maynard's building.*6. Caption: A full baker's dozen black bear were photographed at the garbage disposal site of the highway building crew in the Bull River valley. Circa 1960. Courtesy J. Randall 'Buck' Beebe collection. "Billy Finnigan and I run around together," Lanky Jamison said. "His uncle, William Finnigan ran what we knew as the Finnigan saloon." Bob Saint said. "You could go there with a ten pound lard pail and fill it full of draft Creme Beer, a sweet drink, for 25 cents. The Creme beer we got was shipped in in kegs, just like regular beer. Only it wasn't beer. It was the forerunner of a soda pop. We thought it was a wonderful drink and of course we had lots of children in there. "Once you'd tasted real beer Ne'er Beer wasn't fit to drink. It had a beer taste. But absolutely no alcohol. You could drink gallons of it. We used to drink Ne'er beer with cheese and crackers."*7. Then Wm. C. Finnigan died with consumption in the county jail, awaiting trial. Another 'old-timer' was buried. His pool hall closed. The townspeople mourned him.*8. Sheldon S. Brown had a pool hall in the old Noxon Hotel building he'd bought from Mrs. Lena Baxter.*9. "Sunday School" Brown we called him. He had the usual pool table and card games. And he had a little soda fountain where he sold ice cream. Also, Harry Skillicorn, a little crippled fella, had a barber chair in the front room. He'd been a jockey and was all busted up from racing horses. A short time after that Mrs. Bartholomew bought the place and "Strawberry", run the place as a pool hall. He kept it for several years," Saint said. Caption: Sheldon S. Brown (1887-1933) and Lillian Drury Brown (1866-1949). Courtesy Loren 'Lanky' Jamison collection. As prohibition cracked down, kids got some of their first sightings of airplanes, which were almost as rare as hen's teeth or snipe on a "snipe hunt". Airplanes flying over the valley were believed to be carrying Canadian whiskey*10. "Noxon didn't change much with prohibition, except it went from legal liquor to making moonshine," Bob Saint said. "In fact probably we had moonshine previous to that."*11. But prohibition did bring law enforcement officers into the valley more frequently than before. Their visits were no longer confined to an occassional train ride to Noxon. Although the roads were still primitive and difficult to get over, now the sheriff had a car. "H. D. Lytten and Dr. Toothacher of Noxon were brought back to Thompson Falls by Game Warden Anderson and Deputy Sheriff Prouty Monday night. The men were accused of killing deer out of season. The case was brought before Justice Adams Tuesday morning. It appeared that Toothacher had no part in the offense and the case against him was dropped. Lytten pleaded guilty and was fined $25.00. "It is said that Lytten had been to the Toothacher ranch on Bull River, took his gun along to butcher some hogs. On his return he jumped a two-year-old buck and in his excitement he overlooked the fact that the season had closed for game. A neighborhood difficulty resulted in the officers securing the information upon which the arrest was made." Caption: Bill Getske with one of the many black and brown bear he killed especially to provide grease and meat for Pauline Gordon's larder. A noted pastry cook, Pauline preferred bear grease to lard for baking, as did many other fine cooks in the valley. Circa 1940. Courtesy Bobby Cluzen collection. Feelings were mixed among community residents as they read newspaper accounts about their neighbors, relatives and friends. Many scoffed at the prohibition law and preferred the 'good old days', some felt humiliation, while a few snickered with glee, gloated and felt vindicated because the offenders had not embraced their set of values, and had been vocal in their opposition. The majority just plain felt uncomfortable as long as the editor continued to spotlight the lawbreakers living along the lower reaches of the Clark's Fork River. "Jesse O. Beason, Alex Orr, Oliver Graham and S. S. Brown were arrested at Noxon Saturday for breaking the dry law. The arrests grew out of an investigation conducted by a couple of special agents who went to Noxon several weeks ago to operate. "They posed as bridge builders and by shivering and shaking persuaded some of the residents to jar loose with a little grog. They had plans and specifications for the new bridge; of course it was a subject that interested everyone. By building up confidence with the folks they discovered what many of the neighbors knew nothing of. "S. S. Brown emphatically denies that he sold any loquir (sic) to anyone and that he had secured it for his own use only and his statement is borne out by numerous Noxon people. "Sheriff Hartman's office made another haul last Saturday of one of the largest and most complete stills that has been located in these parts. "James Saint of Noxon and Joe Watkins of Sand Point were the proprietors of the flourishing distillery and accompanied the finished product to the sheriff's office. "The still is about a 35 gallon one and at the time of arrest about 15 gallons of stuff ready to market was taken. The bottled goods were put up in regular whisky bottles with a label reading "Gooderham and Worts, Ltd. Canadian Rye Whisky," and a seal over the cork that is a good imitation of the real thing. There were also about three barrels of mash ready for the finishing touches. As the headlines continued, a few readers cancelled their subscriptions. But everyone, including youngsters of the hamlet listened avidly, and, as people will, some used the gossip to their advantage. "Ranger Ben Saint's brother, Jim Saint, bought the Jewett car, a Big one" Lanky Jamison said. "He ran booze through Bull River and Bonners Ferry to Canada and never got caught."*12. "Jim would get a note saying that there was a load of booze at a certain place. He'd go get it. There'd be nobody there. He'd simply drive there and pick it up. "There would be a note with the booze and it would say, take it to such and such place, and your money would be at such and such a place. So he'd take it and deliver it, take the money and go on home. "They put the money in little Calumet Baking Powder (cans) kicked down under the bottom of the wood stump. Jim would kick the ashes out and get it. "Us kids used to go down to Jim's and play with that money. When Aunt Ethel and Jim were gone some place we'd go down and play with Gerald and George. We knew where the can was kept and we'd go in, get it out and play with it. Then put it back in the cans and stick it back under. The object was just pretty paper, you know. It was paper money."*13. Caption: This silouhetted hunter looks at the Clark's Fork River valley from a promonitory on Government Mountain, circa 1940, before the Noxon Rapids Dam, built by Washington Water Power Company, inundated much of the bottom lands with Noxon Rapids Reservoir. Courtesy Wallace 'Wally' Gamble collection. Fred Minear said,"I was out playing with Dan one time and by gollies, Perry Heater, who was the sheriff, came down. I didn't know Perry Heater was sheriff at that time. I was just a kid and Dan and I was scufflin out there and it was dark and by gollies Perry Heater took Dan over to the NPRR depot. "She rolled up her arms and away she went! I wouldn't want to of met her either. She brought him back in a hurry."*14. Was Ethel guilty? Did they plant a bottle on her? She was arrested once. "No," Fred said. "She was one of the doggondest bootleggers. You know, my mother, Mrs. Minear, worked there at Ethel's cafe until 1922, all the time. And I practically lived there with Dan and Goldie and Mary."*15. "'I'm wondering,' Ethel said. "And she just reached over with one hand and knocked the drinks out of their hands and reached back with the other hand and broke the jug over the stove. "'I don't believe you've got any evidence,' she said. "I think that's the closest she ever come to being arrested. To the best of my knowlege. At least I never knew of her to go to jail. If she'd have been arrested she'd went to jail. I think that's probably the closest. Everybody laughed about it. It was a big joke there."*16. Swan Swanson said, "Ethel sold a lot of bootleg whiskey. She'd carry that flask in her breast pocket and sell drinks from it. But she didn't make it. She bought it from the still up there on Pilgrim Creek."*17. "80 acres good bottom land 3 1/2 miles from Noxon on good highway, partly 20 acres Alder Bottom land, fine outside Range. Will sell cheap for cash. J. O. Beason, Noxon." A month later Jesse Beason still advertised his homestead for sale. *18. In 1921, Napoleon Laramie left his homestead in Bull River to move west to Sand Point, turning his goats loose. They went wild in the hills and fell prey to predators.*19. John Coyer took up a homestead nearby. When Coyer became paralyzed from a stroke before proving up, he sold his relinquishment to Maynard McDuffy, Cap Berray's nephew. Laramie returned, taking a place in Napoleon Gulch and began taming deer, putting feeding stations out for them. He enjoyed the pastoral quiet of the secluded area. Did he make moonshine there? Revenue men thought so. They beat him up pretty badly, according to Stewart Hampton. Roy Newell and Dan DeLong with their black bear, 'totin' him home for butchering. Courtesy Dan DeLong collection. Federal Revenue men roved the area. And anyone working for the forest service was expected to assist them. One time the federal agents came to tell Walter Lake, at the Bull River Ranger Station, there was to be a shipment of bootleg liquor coming through in the night. "Sheriff Howard Larson and a deputy came, camping across the road from the house one night," Lula Lake said. The Feds hid there and put a log across the road. About midnight two or three big cars came. "They caught two Canadians that were boot legging whiskey from Canada to the U.S.A. It was quite a frightening experience. They confiscated the whiskey they had. I heard them stop the car, but kept very quiet. Money was scarce those days and a dollar was very precious."*20. "My folks watched through the front window. Later they gave the folks a bottle of the liquor which mother kept for many years."*21. "Let's see, Coley, was a bootlegger. That would have been James Colvin's dad. We called him Coley. Don't know what his first name was. Don't have the slightest idea. "There were several of them (moonshiners and bootleggers) around Martin Creek and around Trout Creek. And normally if they made fairly decent moonshine, well, I think the federal people simply left them alone. If anyone died of rotgut, well of course they picked them up, in self defense."*22. Ethel once was picked up on charges.*33. Albert Sandy was known all over for his bootlegging. "We used to go up there. And they'd tell about John Erickson and other old cronies and they'd get on a big drunk for lord knows how long. "It's the first place on the left after you go around the high bank on the Pilgrim Creek road. Sandy was a good moonshiner. Don't know where he learned it."*24. Glen Nelsen said, "Napoleon was beat up really bad by the revenuers. They shouldn't have done that. He was a really nice old man just trying to make a living. They never did find his still in Hamilton Gulch up Bull River."*25. 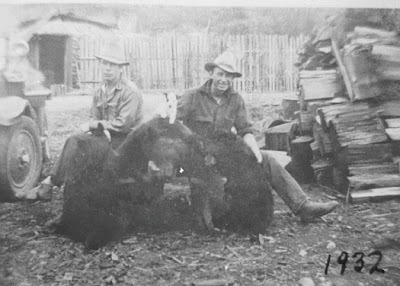 Caption: Earl Clayton and Melvin Gegnold pose with a fine bear cape from a bear they trapped on Fatman Mountains in 1930. Money from bear hides augmented incomes while meat and lard were food for hungry families, settled in the mountains of northern Idhao and northwestern Montana. Courtesy Earl Clayton collection. What effect did prohibition have on the money circulating? Illegal liquor sold at Noxon for $1.00 a pint, Bob Saint said. Kids looked on it as a bonanza for a different reason. "Bottles that had been used during the saloon years were recycled for local liquor. Practically always it was in the flat, or pint bottles. When we were kids we used to scrounge the country for these flat bottles because we got ten cents for a flat pint bottle and five cents for a flat half-pint bottle. "We used to sell my aunt about all we could get. If you could find ten of those bottles, you had yourself a dollar after the bootlegging began."*26. "Bootleg bottles sold to bootleggers for 5-10 cents for empties. Kids made change gathering them up and selling them. Moonshine sold for $1.50 a pint, $8.00 a gallon. It was put into paper sacks."*27. "I'd go to the dances and watch for whiskey bottles," young Dan DeLong said. "Sometimes I'd find some with a wee bit and pour it from one to the other then sell the bottle and drink the liquor. I was always an ambitious character trying to make a buck, you know. So old Sandy, I'd take them up to him and he'd give 10 cents apiece for the bottles. Whiskey bottles. Once he wasn't home so I left them on the step. The next time I came he says, 'Boy you shouldn't have done that. A revenuer man might have come along.'" *28. Caption: Honas Behmerwohld propped his bear up for a photograph, before dressing out his kill at his ranch near Heron, Montana, 1958. Courtesy Harry Behmerwohld collection. Not everyone approved of moonshine making and bootlegging. But efforts to assist prosecution often found hard going making law-abiding citizens wonder whether their law enforcement really wanted to stop it. Clifford Weare received the following response. "Your letter of January 18th in regard to the killing of Prohibition Officer Johnson is at hand. I have mailed the same to Deputy Prohibition Administrator Church here, who succeeded Mr. McClure, lately deceased. "This matter occurred outside of Spokane County, and, consequently, would be out of the jurisdiction of my office. I thank you, nevertheless, for the interest that you take in the matter, and I trust that it may be of assistance to the Federal authorities."*29. "I appreciate the fact that some of the witnesses in the Laramie case are, as you class them, Bootleggers. "I also appreciate the fact that these people, or this gang, as you term them, are taxpayers in this county. It would seem to me that it would be a poor stand for any official of this county and state to refuse protection and redress to any person merely because he was involved in the liquor business." He ends by inviting Weare to "stop in and have a talk about it."30. Stewart Hampton and Harvey Nelsen show off the bear hides from the animals they killed for their familie's meat and lard supply. Circa 1932. Courtesy Stewart and Agnes Hampton collection. Caption: Jonny Duffy killed this good sized grizzly bear and then 'posed' him on a stump for the photograph. Circa 1940s. Courtesy Geraldie Brooks LaMarche collection. Caption: October, 1940 at noxon, Montana. Hulbert, Ann Larson, Hattie Jenkins pose with a bear skin draped over stumps for display in front of Ann's house. The carcass is already hung in the barn for curing before the grease will be rendered and the meat canned. Courtesy Bobby Cluzen collection. Caption: Johnny Duffy's grizzly, killed near the Montana-Idaho border in western Sanders County, Montana, circa 1940s. Patrick Duffy collection courtesy of his daughter, Geraldine Brooks LaMarche. "During prohibition there was a lot of bootlegging going on and once in a while there would be a bad batch. More than one old timer died in this fashion," Johnny Knutson said. "One was Dan Coan who lived up McKay Creek. He died in his bed from a bad batch of booze. These old bachelors weren't always missed right away and sometimes it was a while before they were found. In this particular case they found Dan dead in his bunk."*31. Caption: A group of heron men. Emil Gavin is on the right and Everett Jenkins is on the left. The identities of the others are lost to history. Courtesy Ellen Jenkins Innes collection. Loren 'Lanky' Jamison, tape-recorded oral history January 2, 1987. Ellen Jenkins Innes, letter November 30, 1986. Agnes Hampton, oral history, November 18, 1983. Stewart Hampton, oral history November 18, 1983. Margaret Larson Cluzen, letter. Lena Baxter sold to R. A. Carner, August 3, 1939 recorded deed No. 55785. R. A. Carner sold land to Marineus Larson, August 8, 1939, reserving the right to remove the building within a reasonable time. Loren 'Lanky' Jamison, tape-recorded oral history, January 8, 1987. Fred Minear, tape-recorded oral history February 1, 1990. Sanders County Sheriffs: John H. Massey (1907-07); Clyde E. Baker (1906 & 1909-11); Sam Vanderpool (1911-13); William Moser (1913-15); Joseph L. Hartman (1915-23 & 1925-27), Republican; Perry A. Heater (1923-25 & 1927-33), Democrat; Phil F. Johnston (1933-43), Republican; Howard Larson (1943-51) Republican; Wally Britton (1951-61, Democrat; A. Ben Cox (1961-67), Democrat; Richard J. Cole (1967-71), Democrat; Robert H. Snider (1971-73), Democrat; A. A. Cheney (1973-77), Republican; Harvey Shultz (1979-82), Democrat. Sanders County Independent Ledger, September 8, 1921. Lula Lake, letter July 3, 1975. Almeda Lake, letter November 7, 1989. Glen Nelsen, tape-recorded oral history 1988. Clifford R. Weare papers, January 28, 1929. Clifford R. Weare papers, April 3, 1930.